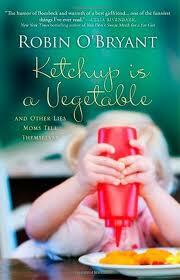 Ketchup is a Vegetable starts with the “simple concept” of carpool lines. Those of us who have been there and done that agree that it’s not the dropping off that’s the problem so much as the picking up, especially when different grades are dismissed at different times. Parents inevitably get in line way before dismissal, backing up traffic. When her daughter finally gets in the car, she darns evidence of PTA “brainwashing” and recites a monologue, urging parents to bring kids to Chick-Fil-A “to have a milkshake with the principal.” As I read O’Bryant’s tale of the daughter’s meltdown because “everyone was going,” I felt like I was reliving a moment of my own life, except in our story it’s McDonald’s. “PTA people, stop this! This instant! My child goes to public school for a reason! If I could afford to take a family of five out to dinner every night and had friends who didn’t buy all their wrapping paper half-price at K-Mart after Christmas every year –my kids would go to private school,” O’Bryant pleads. Since my children’s fundraiser kicks off with the stopping of all instruction so the entire student body can assemble in the cafeteria to see the prizes they’ll win if they sell enough items, I could relate. Having refused to participate in such shameless marketing ploys but still wanting to support the cause, I sent monetary donations directly to the PTA these last five years. However, this year, the lure of a plastic penguin keychain was too much for my six-year-old to bear, and when my ten-year-old piled on her desires to attend to a special sellers-only magic show, I caved. I would much rather do what O’Bryant explains her sister does. “[The PTA] gave you the option of volunteering or writing a check for fifty dollars…I’d pay the PTA fifty dollars to quit programming my child to peddle their wares on the streets of Mount Pleasant for some stupid plastic monkey that I could buy for a buck at any Dollar General – but NO.” I have yet to meet a parent who doesn’t feel the same exact way about school fundraisers yet the madness continues. It’s like the parents who complain their kids have too much stuff, but they’ve started their holiday shopping already.